Lori Karasek did just that. This novice traveler intended to book a relaxing all-inclusive beachfront hotel in Jamaica for her son and herself. But she accidentally ended up with a nonrefundable, landlocked business hotel that forbids children — located one hour from the beach. Now Karasek is asking the Elliott Advocacy team if we can do anything about her $1,500 vacation planning gaffe. Karasek’s colossal booking mistake underscores the fact that not everyone should attempt to book their own travel. In this case, a professional trip advisor could have provided critical guidance to this rookie traveler. And although we don’t typically mediate self-created fiascos, Karasek has an extenuating circumstance that I found difficult to disregard. Karasek has been nearly bedridden for the past ten years as a result of complications of Lyme disease. One of those complications is that, at just 50 years old, Karasek is suffering from early onset dementia. She wears an Exelon patch and takes daily medication to slow the progression of the brain disorder. Karasek then used Priceline’s Express Deals to try to book the lowest rate for an all-inclusive beach hotel. 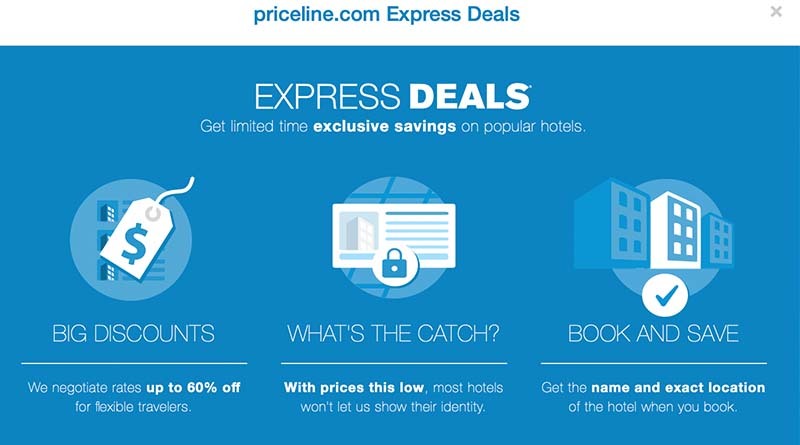 This feature on the Priceline website allows travelers to book time-limited low rate hotels. Those properties are sometimes discounted up to 60 percent. There’s one major caveat, though — Priceline doesn’t reveal the specific hotel until after you confirm your reservation. To the best of her recollection, Karasek told me, she requested a beachfront, all-inclusive hotel. Not familiar with Jamaica, she did not indicate any specific town or parish. When the search results came back, she selected the lowest rate and clicked “confirm.” She was pleased with the ease of the process. And then came the big reveal, and Karasek suddenly realized she had made an enormous booking mistake. I know nothing about Jamaica, so I called the hotel to ask about the beach and all-inclusive features. They said they were an hour and a half from the beach. And nothing was included as it was a business hotel and not a resort. I was shocked. That’s when I realized I made a booking mistake somewhere along the line. Within one hour of making the reservation, Karasek was on the phone with Priceline begging to cancel. She explained that she thought that every hotel that Priceline listed was a beach hotel. She had not read the fine print or taken a close look at the general location of the hotel before she confirmed. Unless specifically noted otherwise, all hotel reservations are non-cancelable, non-refundable, non-changeable and non-transferable by you. Once you purchase a reservation, your method of payment will be charged for the amount shown – regardless of whether or not the reservation is used. Credit will not be given for unused reservations and cannot be used toward any future purchases. Karasek says she was devastated by her $1,500 booking mistake. Not knowing what else to do, she wrote a novel-length letter begging Priceline to reconsider her problem. There were multiple problems with Karasek’s letter that made it ineffective. First, as Christopher Elliott points out in his article on solving consumer problems, you must keep your request for help brief. Company executives, consumer advocates and customer service representatives receive tons of these types of letters every day. To make yours stand out, make sure it’s short and sweet. Karasek’s letter detailed all her struggles with her illness during the past ten years. Her request to change her reservation was buried somewhere inside the message. But I thought it was likely that no one reading the email had gotten that far. The second problem with Karasek’s letter is that it leaned heavily on what Christopher calls the deck of misfortune as a reason that Priceline should let her cancel. When a consumer makes a long list of misfortunes that have visited their life and bases their request for help on those events, it almost always backfires. If your tragedies or hardships have nothing to do with the consumer problem you’re trying to resolve, it’s usually best not to go that route with your complaint. This tactic didn’t work for Karasek either. Priceline turned down her request. She then contacted the hotel, and it was similarly unable to grant her wish to cancel. Her last hope was with the Elliott Advocacy team. Can the Elliott Advocacy team help correct this booking mistake? When Karasek’s request for help landed in our inbox, I read through her entire tale of woe. I had sympathy for her situation. But I didn’t think we could do much — unless there had been a computer glitch in the Priceline system that day. If that glitch had allowed a landlocked hotel to appear in the search results, but she had asked for a beach hotel, a refund might be possible. I’m physically ill over my error. That money represents a house payment. I realize I should have been more careful. To lose that much money is sickening. I don’t know how much longer I have until I don’t know who my own family is. I was just trying to spend quality time with my son. But our advocacy efforts are based on correcting situations in which a company has made a mistake — righting a wrong. Each week, our team receives many requests from consumers who would like us to ask companies to give them a goodwill gesture. We turn down almost all of these appeals. Some are easy to turn down while others aren’t so cut and dried. I was torn over Karasek’s predicament. My impression was that her dementia symptoms led to her imprecise vacation planning. And there seemed to be a small chance that a computer glitch had created this problem. So I decided to offer the facts of Karasek’s case to our friends on the executive resolution team at Priceline. I noted that Karasek’s is not our typical type that our team would pursue, but I thought they might want to take a look. I just wanted to follow up on this case. Our executive care team has investigated. We are going to refund Ms. Karasek’s reservation. I realize this is not the sort of case you might typically bring, but you can always feel free to do so. Thanks. Karasek was elated with the news. In the end, she and I discussed her illness and how it likely contributed to her error. She agrees that her early dementia precludes further attempts at booking her own travel. She intends to allow a travel professional to rebook any future vacations so that this type of booking mistake never happens again. Did I do the right thing asking Priceline to consider Karasek's case? Posted in Advice Tagged A HAPPY STORY ABOUT PRICELINE, A PRICELINE GOODWILL GESTURE, HERE'S WHY A TRAVEL AGENT CAN SAVE YOUR VACATION, IF YOU WANT A BEACHFRONT RESORT DON'T BOOK A MOUNTAIN HOTEL, NOT EVERYONE CAN SUCCESSFULLY BOOK THEIR OWN VACATION, SHE MADE A GIANT BOOKING ERROR ON PRICELINE EXPRESS DEALS, TERRIBLE BOOKING MISTAKE STORIES, WILL HER HOTEL BOOKING ERROR COST $1500, WILL PRICELINE FIX HER TERRIBLE BOOKING MISTAKE?